This is one of our favourite tuna recipes! 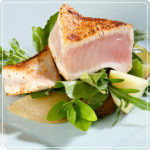 This tuna recipe doesn’t use canned tuna but fresh Albacore Tuna. It is a really good tuna recipe and we know you’ll enjoy it. In the second bowl whisk the egg and lime juice together. Carefully place the tuna into the pan and sear each side until the panko turns golden brown on all sides. For rare tuna sear for about 1 minute on each side. Place the tuna onto a paper towel and pat away excess oil, and then serve.